Would you dare to have an edgy wedding out of the ordinary? 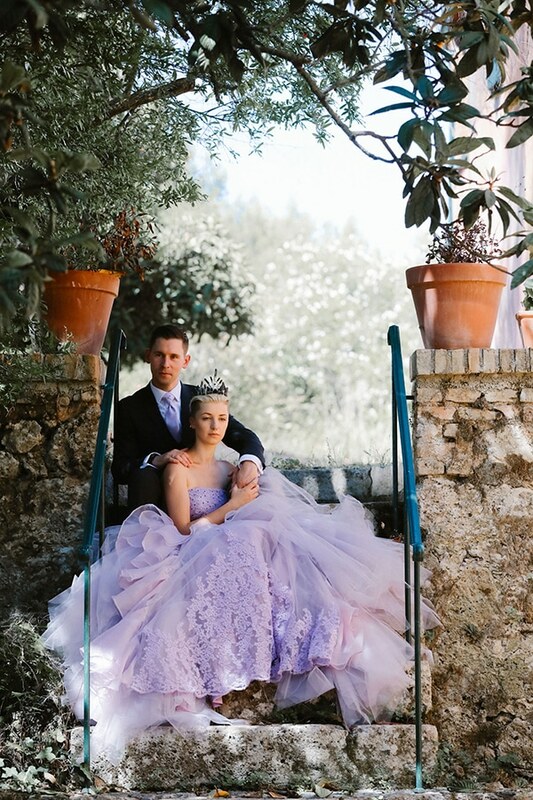 Today’s couple did not hesitate to have a gothic style wedding with unique details in beautiful Corfu! From the custom made lilac chiffon wedding dress embellished with tiny black onyx beads to the unique bridal bouquet with silk roses in black and grey, this wedding does not go unnoticed! 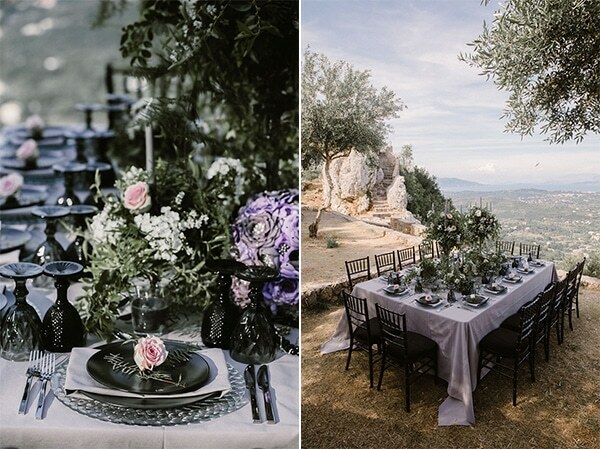 The symbolic ceremony and dinner were held at Kaiser’s Throne Hill, an isolated hill with olive trees and a stunning view. 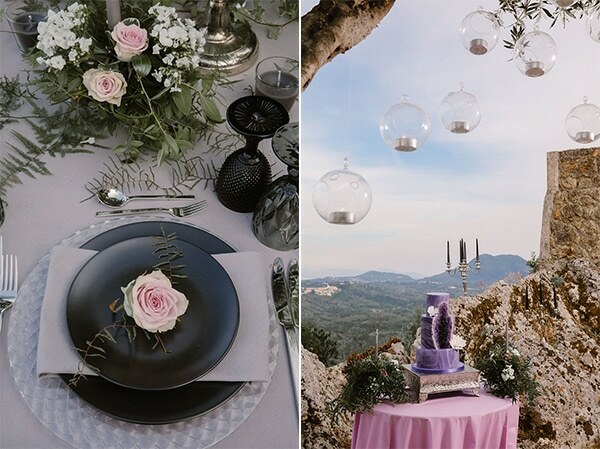 Belli Momenti created a fairytale setting with hanging candles in tiny glass orbs, an arch with wild flowers and a stunning table setting in lilac hues with beautiful flower arrangements, antique style silver candelabra and black crystal glassware! Have a look at the beautiful photos and be mesmerized! “The term bespoke wedding is the only one that best describes this special wedding because everything had to be organized from scratch in this wild and virgin full of natural beauty location. 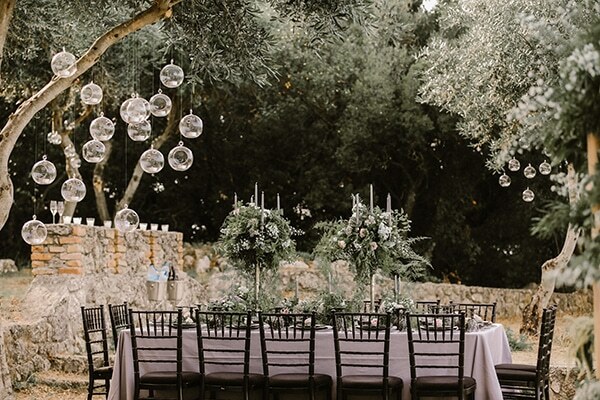 We had to clear the hill from the wild vegetation with mowers, to trim and beautify the olive trees, and adjust the whole place with elegant decorations for this special occasion. It was one of those challenging weddings that tested our limits as Wedding Planners giving us the opportunity to get better. With lots of love and agony for the result, we finally did it! Selina and Carl’s Wedding was a fairytale with a happy ending that it will always stay in our hearts and we will recite for many years to come”. 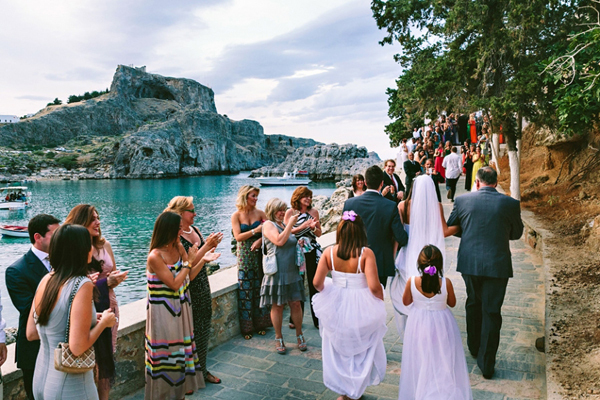 From the bride: “We met while travelling and he proposed on a private cliff side in Corfu, overlooking the sea. 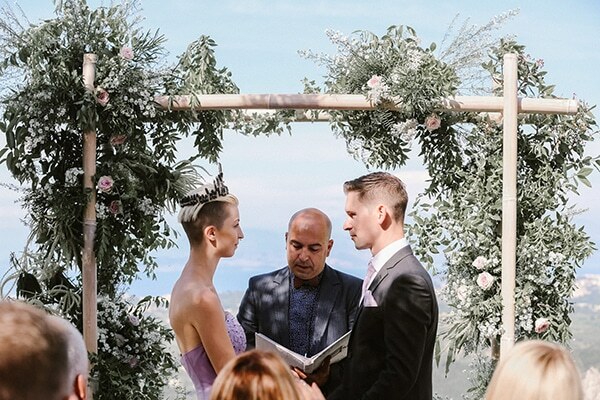 The ceremony took place in Kaiser’s throne in Corfu, Greece, a private section of cliff side with ruins and an old turret. We picked Corfu as we come every year and love the magic of the island and the friendliness of the people”. “The concept was boutique, with elegant gothic style accents. 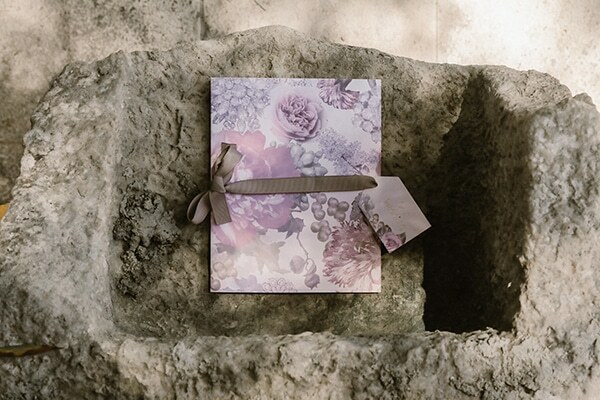 We went for charcoal grey and lilac purple colour theme, with natural style flowers everywhere. The wedding decoration was gothic-chic, with antique style silver candelabra, black crystal glassware and silver table settings. 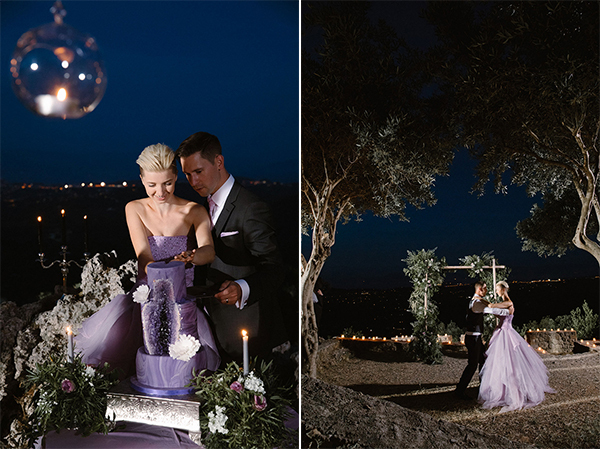 We had 300 candles lining the battlement walls of the fort, and candles throughout the olive trees in tiny glass orbs. 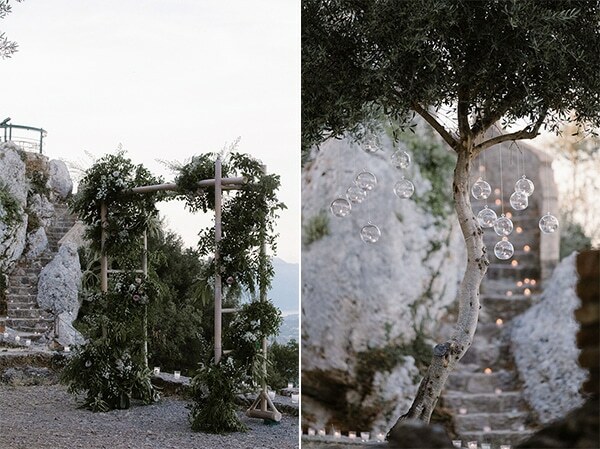 The ceremony was held under an archway of wild and natural style flowers, in the same lilac as my dress, and the reception flowers were enormous and placed on and around two huge silver candelabra”. 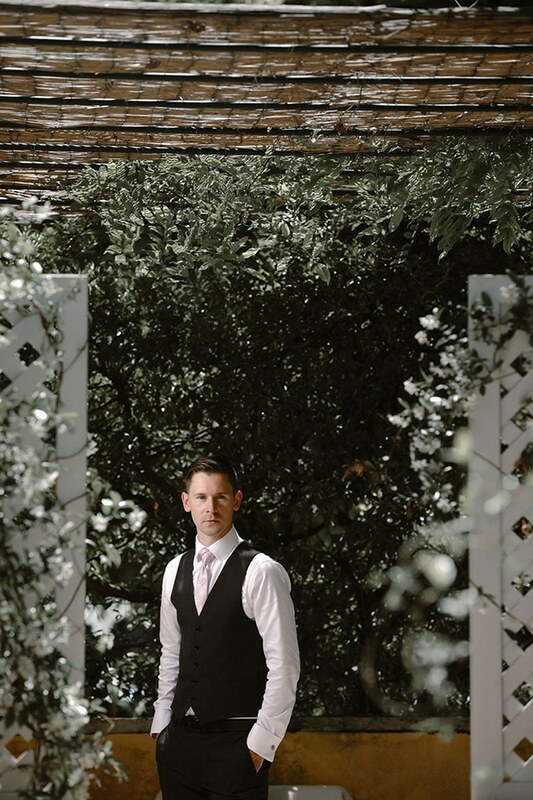 “For my bridal bouquet I picked silk roses in black and grey to match both my dress and my husband’s suit. 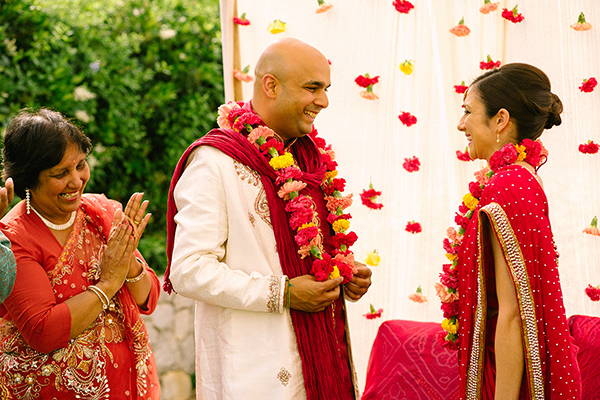 I then hand jewelled them with black onyx beads (which I had put on my dress too)”. “I used some inspiration from various artists on Haute Macabre (gothic blog with designers and photographers and artists), but mainly my own designs for the dress and cake”. 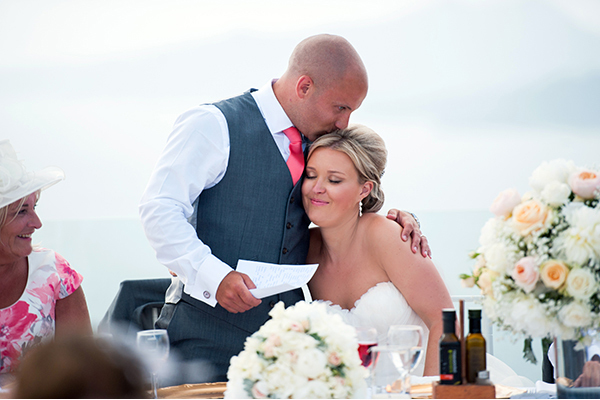 “The best moment of our wedding was cutting the cake and realising we didn’t know what flavor it was going to be! We had spent so long designing it, we didn’t specify what flavor. It was chocolate fudge, so it was great in the end though”. 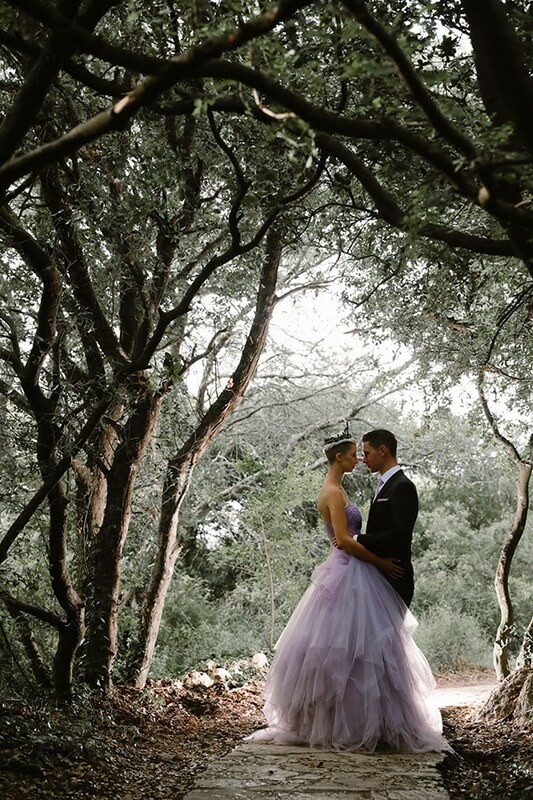 “My wedding dress was a custom made and hand embellished chiffon dress in lilac. Tight fitting strapless bodice on the top half and enormous puffed-out bottom. I wanted to look like a fairy-tale princess and it was perfect. 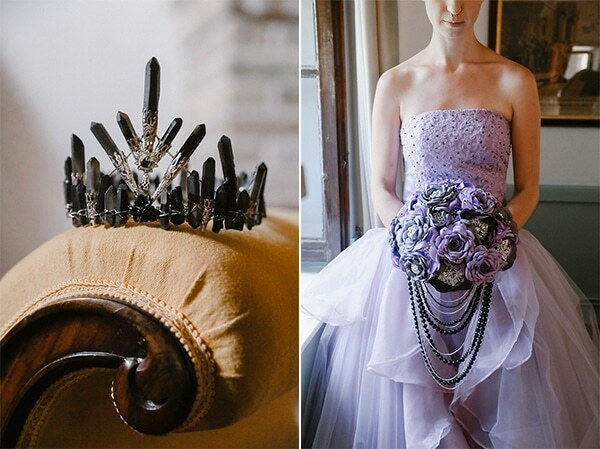 I embellished the bodice with hundreds of tiny black onyx beads (to match my bouquet and crown)”.